Today is the 9th day of the 9th month of the 9th year of this century, and as usual, our thoughts turn to gardening. There are some interesting aspects to the number 9; some are curious, some are odd, and some are just too scary or way off topic for a lovely gardening blog. In fact if my garden sounded like the Beatle’s recording of Revolution 9, I think I’d move. To commemorate this unusual date of 09-09-09, here are nine “to do” items that you might do to ensure your garden is “dressed to the nines” for Fall. 1. Weed. Always the weeding! They are always out there, hiding, lurking, storing up energy for winter. They love your garden best, don’t they? Pull those weeds out. Don’t let them set seed, don’t let them grow even deeper roots. 2. Mulch. Is there ever a “done” to mulching? My garden always seems to need mulch somewhere. Perhaps that is because I never seem to get it mulched all at once in the spring like some people do. So I’m scouting areas of the garden that could use a good measure of mulch going into fall and winter. 3. Edge. At night, while you sleep, your lawn creeps just a little further in to that flower bed you so carefully edged in the spring. I advise you to sleep with one eye open and to try to edge a bit before it gets really cold out there. Show your lawn that you mean business and you aren't going to let it take over your flower beds. 4. Plant. Don’t give up gardening now! We all know fall is a good time to plant, so go buy some new plants and plant them. In this economy, I’ll bet your local garden center would appreciate the business, too. And a bonus is they probably won’t be that busy and will have time to answer your questions and show you the best plants they have. 5. Deadhead. It’s a balancing act out there in the garden. Should you leave the seed heads of perennials like Rudbeckia sp., Monarda sp., and Echinacea sp. for the birds to eat and to provide winter interest? 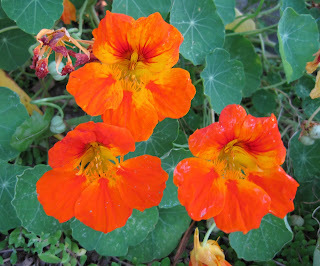 Or should you deadhead them to avoid having them self sow all over the garden? Decide what you want for your garden and deadhead as you wish. 6. Order. It’s time to order bulbs for spring flowers. You know it is. Even the procrastinators are ordering their bulbs. Well, some of them are, others will just happen to see some bulbs at the big box store one day and buy a few on impulse. Those same people may or may not even plant those bulbs. Don’t be them. Order some bulbs now before the bulb companies are sold out of the bulbs you really want. Or get thee to your local garden center and check their bulb displays and buy some to plant later this fall. 7. Seed. You’d better hurry because fall is the best time to overseed your lawn. Here in my zone 5 garden, September 15th is usually the last day to sow grass seed and still give it time to germinate and get established before it gets really cold and the lawn goes dormant. Hey, isn’t September 15th also the next Garden Bloggers’ Bloom Day? Why, yes it is! 8. Accessorize. I’m not referring to tacky Halloween decorations! Now is a good time to find some of those big containers and other garden décor items marked down for clearance at the end of the season. It wouldn’t hurt to go to the garden center and just look around, would it? Ha! We’re gardeners! We stop at the garden center at our own pocketbook’s risk knowing we’ll find something we have to have that we didn’t know about five minutes before we got there. Like bulbs (see above). But go anyway. 9. Enjoy. Yes, I know what Henry Mitchell wrote about Fall*, but it’s still good to take time to enjoy your garden in all seasons, including Fall. Otherwise, what’s the point of having a garden? To indulge our weeding compulsions? And that’s nine things to do in the garden on the 9th day of the 9th month of the 9th year of this century. nice article posted at special date..
How did Henry know I was just sitting out in the Casa yesterday just soaking up the cool weather?? Your 9s are a good suggestions. 1. Weed. This one has become an easier task with my brand new CobraHead Weeder. Come to find out, the blade is manufactured right here in Green Bay. CobraHead LLC is located in Cambridge, WI. I luv how the tool is described as a strong, sharp "steel" fingernail. This is interesting, too. I've been reading the Cobrahead Blog since last winter. I'm rambling, sorry. 6. Order. Thanks for the reminder to get busy and order/buy bulbs...and then actually plant them. 09-09-09 is just too good to pass up. The weather has been perfect, but it's making me want to loll instead of work. Your list has suggested more chores than I am quite ready to take on. Maybe this weekend? I love the number 9. Thank you for using it to write a garden chore reminder list. When I read the title of this post, the first thing that popped into my head was "Number 9, Number 9" from Revolution 9. I suspect listening to the Beatles at a tender age warped me for life. I agree, fall is not a time for idleness. There are all those plants I picked up over the summer, still waiting to go into the ground. Ackk! Great reminders Carol. I am anticipating the array of fall colors! Hi Carol. Great ideas - I'm going to be busy! Nice post, Carol. But if you were living in Austin you'd have had to squeeze in "Water" on your list, because even though we've had some showers, our gardens aren't out of the woods yet, so to speak. Each day I see more dead trees around town, victims of the drought. I spent much of my gardening time today with hose in hand. You people are such layabouts. I've worked so hard here that it's already the 10th! Plant in fall/autumn. Our planting is always geared to March-April-May before the winter rains. Or we've missed our chance till next year. Quick, BUY, then plant, that lemon and the olive trees!